21 LISTS The BeatlesLists about the Fab Four, who changed the entire world of music starting in 1960 Liverpool. The Beatles officially broke up in 1970, but the Fab Four image they'd grown to hate almost split them up years earlier. Though they'd started to branch out musically with Rubber Soul and Revolver, their recording of Sgt. Pepper's Lonely Hearts Club Band in 1966 and 1967 reinvigorated the band and gave them a chance to experiment creatively. After several years of performing for stadiums filled with fans screaming loud enough to drown out the music, the Beatles had lost interest in touring. "We really hated that f*cking four-little-mop-top approach," Paul McCartney recalled. "We were not boys; we were men. It was all gone... we didn't want any more." Behind-the-scenes Beatles studio stories from the Sgt. Pepper recording period reveal a group of artists who wanted to prove themselves as more than pop darlings beloved by shrieking fans. Sgt. Pepper's Lonely Hearts Club Band inspired at least one Beatles conspiracy theory and marked a turning point for the band in both their sound and attitude. It also foreshadowed their eventual need to explore music individually. And in keeping with 1960's culture, a "free your mind" psychedelic approach to life and art strongly influenced on the album. More than 50 years have passed since Paul McCartney, John Lennon, George Harrison, and Ringo Starr donned colorful, satin, military band uniforms and surrounded themselves with other famous faces for the cover of Sgt. Pepper's Lonely Hearts Club Band. But the album - which Rolling Stone gave the No. 1 spot on its list of 500 Greatest Albums of All Time - remains timeless. And stories about how the album came together are as intriguing as the songs themselves. While flying to London with the Beatles' roadie and friend Mal Evans, Paul McCartney tried to come up with a name for the band's new alter ego for the album. During the flight, Evans became confused by packets of salt and pepper labeled only with the letters "S" and "P." When McCartney pointed out they were salt and pepper, he joked that it sounded like "Sergeant Pepper" together - but the pun had a catchy ring he couldn't forget. Thanks to military-inspired fashions worn by stars like Jimi Hendrix and Mick Jagger, the name was also in vogue. Inspired by other lengthy band names of the era, such as Big Brother and the Holding Company, McCartney tacked on "Lonely Hearts Club," a term once used as slang for dating agencies. Community brass bands also inspired McCartney, giving his fictional band a traditional band sound mixed with modern rock. People often rang the doorbell on Paul McCartney's front gate, and being a nice guy, he usually answered. One evening, a visitor rang and claimed to be Jesus Christ. McCartney let him in, thinking, "Well, it probably isn't [him]. But if he is, I'm not going to be the one to turn him away." The two had tea before McCartney was due at the recording studio to work on "Fixing a Hole." McCartney decided to bring "Jesus" to the studio after the visitor assured him he would sit in a corner and remain quiet. The other Beatles shared a laugh about the visitor's identity, but the man kept his word and sat silently until the recording session ended. The Beatles never again saw the man who claimed he was Jesus. In 1963, George Harrison told the world via a television interview that he loved Jelly Babies, a candy similar to but softer than jelly beans. Not long after, fans started pelting the Beatles during concerts in the US with Jelly Babies and the much harder jelly beans. Harrison was even hit in the eye once by the flying candy. Unfortunately, fans didn't limit their airborne offerings to sweets and sometimes tossed lighters and toys at the band. Would you stand up and throw tomatoes at me? Starr feared that fans really would throw tomatoes at him if the band toured again. Luckily, the rest of the Beatles agreed and changed the line to, "Would you stand up and walk out on me?" During an all-night session to record the backing vocals for "Getting Better," John Lennon accidentally took a tab of LSD instead of amphetamines. 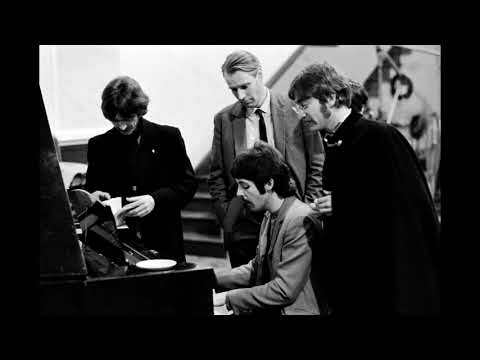 Despite Lennon's staring in amazement at the ceiling and seemingly walking in slow motion, producer George Martin didn't realize what was going on and suggested Lennon just needed some air. The two went out onto the roof, where Martin left Lennon - until Paul McCartney and George Harrison, who knew Lennon was in the middle of an acid trip, realized that was probably a terrible idea. Luckily, they retrieved Lennon from the roof before he accidentally fell and ended the session for the night. You're looking into each other's eyes, and you would want to look away but you wouldn't, and you could see yourself in the other person. It was a very freaky experience, and I was totally blown away.